This is the easiest way to peel pearl onions. 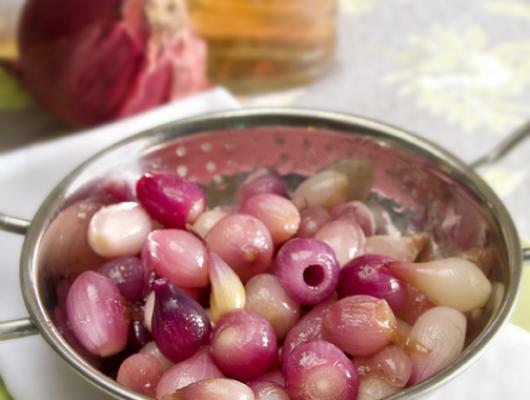 Bring a pot of water to a rapid boil and add un-peeled pearl onions. Boil for one minute, strain and place onions in a bowl of ice water to stop the cooking process. Using a sharp knife, slice of the root end of the onions. Squeeze from the top, and your onion should slide right out. Whisk together honey and red wine vinegar. Set aside. In a skillet, heat olive oil over medium high heat. Add peeled pearl onions and sauté for 3-4 minutes until they begin to brown. Pour honey and vinegar mixture over onions and stir to evenly coat them. Bring heat to medium low and continue to sauté onions until the sauce reduced to a syrup. 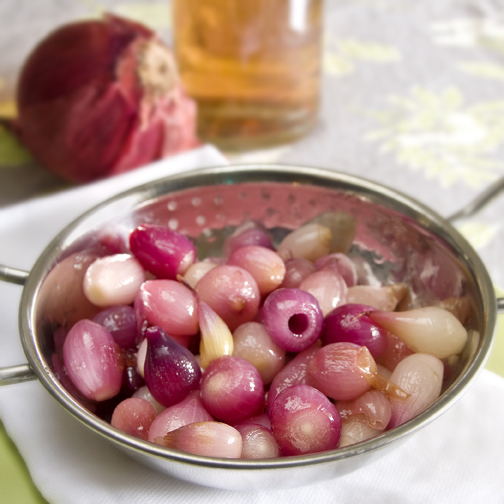 Sweet and tangy red pearl onions in a red wine vinegar and honey glaze. A great side for Thanksgiving.